Many children experience headaches, which can vary in severity, frequency, associated symptoms, and causes. When headaches occur, parents must decide whether and when to seek medical care for their child. The C.S. Mott Children’s Hospital National Poll on Children’s Health asked a national sample of parents with children 6-18 about their approach to getting medical care and advice for their children’s headaches. Two-thirds of parents (66%) reported their child has had a headache not related to a fall or head injury. Parents typically give their child an over-the-counter pain reliever for headache, most often acetaminophen (66%) and/or ibuprofen (62%); less frequently, they give their child prescription headache medicine (5%) or herbal remedies (5%). For scenarios involving headache, parents differed in whether they would bring their child for medical care. If their child had a headache and a tummy ache, 21% of parents would definitely seek medical care, while 43% would maybe and 36% would probably not seek care. Twice as many parents (40%) would definitely seek medical care if their child had a headache with a fever (37% maybe, 23% probably not). Half of parents (51%) would definitely seek medical care for a headache so painful that the child needed to leave school (28% maybe, 21% probably not). Only 4% of parents would take their child to the ER for these common headache scenarios. More often, parents would seek care at their child’s regular doctor (74%) or at an urgent care or walk-in clinic (22%). However, 17% of parents would not give their child pain relief medicine before seeking medical care, so the doctor can see how bad the headache is. For headache scenarios that could indicate a more serious problem, parents differed in whether they would bring their child to the emergency room. 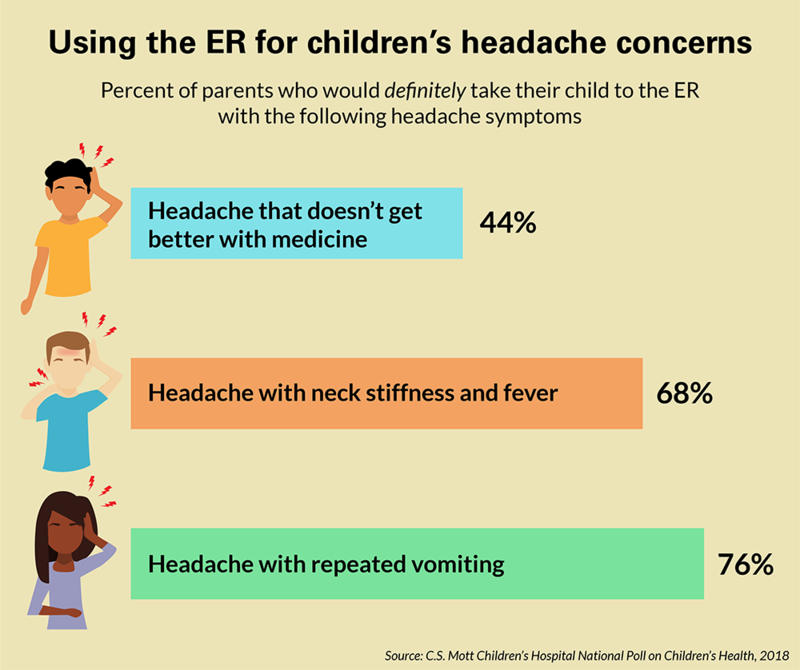 Less than half (44%) would definitely go to the ER If their child had a headache that didn’t get better with medicine, while 38% would maybe go to the ER, while 18% would probably not. For headache with neck stiffness and fever, 68% would definitely take their child to the ER (24% maybe, 8% probably not). If their child had a headache with repeated vomiting, 76% of parents would definitely go to the ER (17% maybe, 7% probably not). Two-thirds of parents report their child has had a headache not related to a fall or head injury. 1 in 6 would withhold pain relief medicine so the doctor could see how bad their child's headache is. Parents vary in whether they would take children to the ER for headache with neck stiffness and fever, possible signs of meningitis. Headaches are common in children. Many headaches are due to conditions like viral illnesses, lack of sleep, depression or head injury; rarely, they are symptoms of more serious conditions like meningitis or a brain tumor. This Mott Poll demonstrates the challenges for parents of deciding what to do when a child has a headache. Even though children in this age group (6-18 years) can describe how they feel, in many cases it will be difficult for parents to figure out the cause of the headache. For common headache scenarios, parent decisions about seeking medical care likely reflect their perception of how serious their child’s associated symptoms might be. For example, only 1 in 5 parents would definitely seek care if their child’s headache was accompanied by a tummy ache, which may be perceived as not very serious. In contrast, twice as many parents said they would definitely seek care if the child’s headache was accompanied by fever, which is viewed as a more concerning symptom. Half of parents said they would definitely seek care if their child’s headache was so painful that he or she needed to leave school. Asking to leave school or an activity can be a sign of how much the headache is bothering the child. However, because many schools do not allow students to have medication without a prescription on file, parents may initially give pain relief medicine before deciding to seek medical care. An unexpected finding in this poll was that 1 in 6 parents would withhold pain relief medicine so that the provider could see how bad the headache is. This is unnecessary, and just makes the child suffer longer. Instead it is helpful for parents to write down key information to tell the provider, such as when the pain relief medicine was given and whether it helped alleviate the pain, other things that seemed to make the child feel better or worse, and if the child has a history of headaches. Some headache situations are potentially more serious. For example, when children have headaches that don’t get better with pain medicine – particularly if they occur frequently and disrupt the child’s ability to sleep, go to school or participate in activities – parents should seek medical care to get an understanding of the cause and possible treatments. The majority of parents in this Mott Poll understood that this situation does not necessarily require an ER visit; rather, parents can start with the child’s regular provider, with the possibility of a referral to a specialist. In contrast, three quarters of parents said they would definitely go to the ER if their child had a headache with repeated vomiting. It is reasonable that parents would perceive this as an urgent situation, especially if the child had sustained a head injury. If parents choose not to bring the child to the ER in this type of situation, they would want to seek care or advice from the child’s regular provider. The scenario of a headache with neck stiffness and fever was likely recognized as possible meningitis by the two thirds of parents who said they would definitely bring their child to the ER. For parents who said they might not seek ER care in this scenario, making prompt contact with the child’s regular doctor, by phone or an appointment, would be essential. Parents who do not recognize the urgency of this scenario, preferring to wait and see if the symptoms subside, could be putting their child at risk, as meningitis strikes quickly. Parental beliefs about seeking care when a child has signs of meningitis also may be influenced by the child’s vaccination history. Several vaccines are recommended at different ages to protect children against bacteria that cause meningitis. However, many children do not receive all recommended vaccines, and the protection wanes over time. Thus, parents who notice signs and symptoms of meningitis should seek care immediately, regardless of their child’s vaccination history. This report presents findings from a nationally representative household survey conducted exclusively by GfK Custom Research, LLC (GfK), for C.S. Mott Children’s Hospital. The survey was administered in April 2018 to a randomly selected, stratified group of parents age 18 and older (n=2,074). Adults were selected from GfK’s web-enabled KnowledgePanel® that closely resembles the U.S. population. The sample was subsequently weighted to reflect population figures from the Census Bureau. The survey completion rate was 61% among panel members contacted to participate. This report is based on responses from 1,731 parents who had at least one child 6-18 years. The margin of error is ±1 to 3 percentage points. Clark SJ, Gebremariam A, Macy ML, Schultz SL, Singer DC, Freed GL. How to handle headaches: A parenting challenge. C.S. Mott Children's Hospital National Poll on Children's Health, University of Michigan. Vol 32, Issue 2, July 2018. Available at: http://mottpoll.org/reports/how-handle-headaches-parenting-challenge.